Washington State Officials Declare State Of Emergency As Measles Outbreak Continues As of Monday, public health authorities reported 36 cases, most affecting children under the age of 10. Most of those with the highly contagious disease had not been vaccinated. A measles outbreak in Washington state has triggered a state of emergency. In Clark County, where 35 cases have been reported, 31 were not immunized. Washington Department of Health officials announced that as of Monday afternoon, there have been 36 confirmed cases and 11 suspected cases of the disease. That is a significant increase from the reported numbers on Friday, when Gov. Jay Inslee declared a state of emergency. At the time, there were 26 confirmed measles cases. In Friday's statement, Inslee said, "The measles virus is a highly contagious infectious disease that can be fatal in small children, and the existence of 26 confirmed cases in the state of Washington creates an extreme public health risk that may quickly spread to other counties." Since then, 10 new cases have been confirmed, nine in Clark County, which borders Portland, Ore., creating concern in that state as well. Washington state epidemiologist Scott Lindquist told NPR that this is likely only the beginning of the epidemic because many of the families with infected children traveled to very public places, including Costco, Ikea, the Portland International Airport and the basketball arena where the Portland Trail Blazers play. Clark County Public Health has identified 35 confirmed cases and 11 suspected cases since Jan. 1, when it first began investigating the outbreak. In 31 of the cases, the person who had contracted the disease had not been immunized. In the remaining cases, authorities had not yet verified their immunization status. Children under the age of one cannot be immunized. So far, King County has reported the only adult case, a man in his 50s who was hospitalized but has since recovered. Although it's not clear where he became infected, the man said he had recently traveled to Clark County. The Centers for Disease Control and Prevention recommends that people who have not been immunized but believe they have been exposed to the airborne virus, get the measles, mumps and rubella vaccine. It explains, "If you get MMR vaccine within 72 hours of initially being exposed to measles, you may get some protection against the disease, or have milder illness." Before the vaccine was introduced in 1963, measles was the single leading killer of children in the world. To this day, it still kills 100,000 people, mostly children a year worldwide, most under the age of 5. Measles was declared completely eliminated within the U.S. in 2000 because the country's widespread vaccination program. However, state laws allowing parents to opt out of mandatory vaccinations quickly began eroding those statistics, leading to outbreaks across the nation. The number of measles cases nearly tripled in 2018, when there were 349 cases, from 2017, which saw 120 cases reported. The CDC attributed the jump to primarily unvaccinated people in the Orthodox Jewish communities in New York state, New York City and New Jersey. The agency noted the outbreaks were associated with travelers who brought measles back from Israel. And, in 2017, low vaccination compliance rates among the Somali-American community living in Minnesota led to a cluster of 75 cases. As NPR reported, "In 2014, there were 667 cases in the U.S., including a large outbreak among Amish communities in Ohio. In 2015, there were 188 cases, including some linked to an outbreak that started at the Disneyland amusement park. Prior vaccination is critical to keeping people from contracting the virus if they are exposed to it." 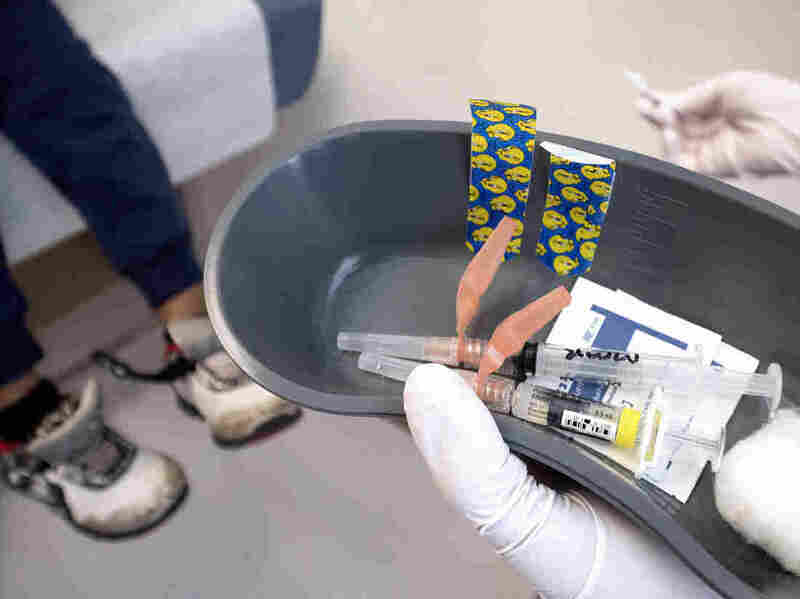 Washington and Oregon are among the country's many states that allow parents with a personal or philosophical objection to decline the measles vaccination, among some others. And Seattle and Spokane in Washington and Portland are among 15 U.S. cities considered "hot spots" for their high rates of nonmedical exemptions to vaccines that cover measles, mumps and rubella. Pediatrician Peter Hotez, dean of Baylor College of Medicine's National School of Tropical Medicine, told NPR there is a very aggressive anti-vaccine lobby throughout the Pacific Northwest that has effectively driven up the rates of vaccine noncompliance, leaving scores of children vulnerable to the infection. The groups often spread misinformation claiming a link between vaccines and autism. A claim that has been wholly refuted by the Centers for Disease Control and Prevention.